A glimpse of Alaska wildlife is always highly sought after and can sometimes be elusive. Since animal sightings aren’t guaranteed, we love to check out the live web cams set up around the state, available online to anyone who wants to tune in. Whether you’re having post-Alaska vacation withdrawals or getting amped up for your big trip, these animal cams are a great way to stay connected to the Last Frontier. Katmai National Park and Preserve bear cam – Katmai National Park is a dream destination for many, primarily for the chance to see brown bears fishing at Brooks Falls. 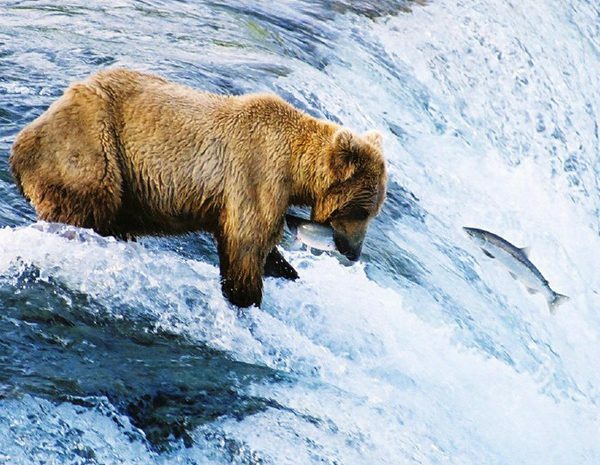 Observers have noted seeing up to 25 bears fishing for salmon in the falls at once! If this trip doesn’t fit into your Alaska itinerary, a great option is to tune into the live webcam from late June through late July for views of the bears from all angles. You can even check out the bear cam’s frequently asked questions for the (almost) full experience of a guided tour. Round Island walrus cam – Round Island is located in the Aleutian Islands of Alaska. It’s about one tenth of a mile wide and is one of the Walrus Islands State Game Sanctuaries. Home to a healthy population of male walruses in the summer months (14,000 have been counted there in a single day), this camera offers a clear and close-up view of these magnificent mammals. Seward Harbor webcam – The Seward Harbor is a great place to explore, as you read off the creative and uniquely-named fishing boats while looking for sea life. This camera gives a constantly updated picture of the harbor, where known animal sightings include seals, sea otters and jellyfish! Alaska Zoo polar bear camera – While it may be extremely difficult to see a polar bear in the wild, you can always check in on Ahpun and Lyutiyik, two of the Alaska Zoo’s biggest stars. The zoo’s live camera updates every few seconds offering up-to-the-minute glimpses of the polar bears’ activity. If you don’t see them, it likely means they’re under the water swimming or exploring another corner of their habitat. Keep an eye on the feed, and chances are you’ll see one of them before too long! From land animals to sea creatures, you can enjoy live streams of Alaska wildlife until you have a chance to see them up-close and in person on your next northern adventure!